Southern Prissy Missy, is a 2 year old grandaughter of Southern Sunrise. She has been broke to ride and has about 45 days of light riding (at two we don't put to much on the, just the basics) She appears to be very laid back and non spooky. We took her to a local indoor arena, and rode her there before a barrel racing event. she handled all the noise and people like a seasoned horse. She has been over ditches and down the road near highway traffic and handles it fine. 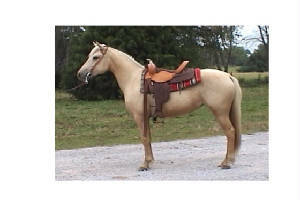 She has the makings for a great trail horse. 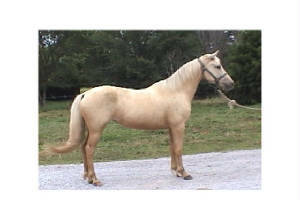 She is not a big mare only about 14 hand as a 2 year old, so will probably be 14.2 as an adult. I have sold all my fox trotters except Missy and her brother they are my last two. She is blue papered and has many crosses to Zane Grey. I am willing to trade her for a Mini "a" size mare or will sell her Sold.. I might have a few foxtrotters listed in the future for a friend who has decided to sell some nice horses, but is not a computer person. Check back.